RoHS (Reduction of Hazardous Substances), Pb−Free (lead−free), and other green programs were not a significant concern in the electronics industry when this article was published in the early 1970s. Instead, research and development efforts concentrated on understanding and improving the chemical and mechanical aspects of soldered electrical connections. 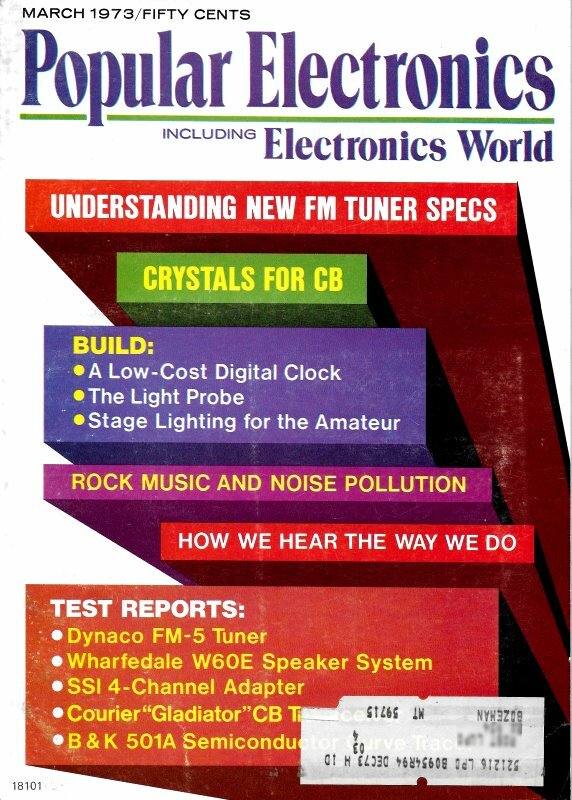 Having "grown up" in the electronics industry during that era, most of my solder and soldering knowledge and practices still tend toward Sn−Pb (tin−lead) alloys for most applications, whether for soldering electronic components to a PCB or terminal post, soldering copper water pipes, or soldering music wire landing gear assemblies for model airplanes. Along with the rather sudden move to lead-free solder came reliability problems including "tin whiskers" and fragile interfaces, a requirement to re-design many component types to endure the higher processing temperatures required for leadless solder, and figuring out how to excuse the extra energy used and Earth-warming temperatures required to accommodate new manufacturing soldering processes (~370 °F for 60/40 Sn−Pb vs. ~423 °F for Sn−Ag−Cu). 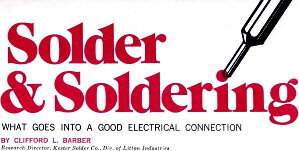 Solder is one of civilization's oldest and most widely used alloys. Its many uses and applications readily lend themselves to relatively simple techniques and processes. Yet, this alloy is one whose properties are traditionally a subject of wide technical and scientific misunderstanding. The somewhat limited technical knowledge many people have with reference to solder is even more pronounced in the case of soldering fluxes. 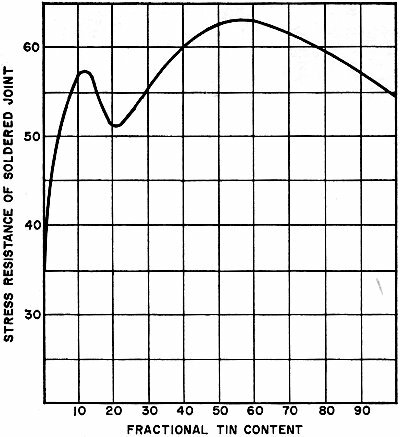 In view of the fact that solder and its fluxes are fundamental to electronics, whether in industry or in the pursuit of a home hobby, it is not surprising to learn that a great deal of the difficulties found in electronic equipment can he traced to poor soldering and/ or poor solders and fluxes. And that poor soldering can, in turn, be traced back to the operator's lack of knowledge about the principles and prac­tices required for good soldering. Soft solder is a fusible alloy whose basic components are tin and lead. Occasionally, small amounts of such metals as silver, antimony, or bismuth are added to the tin and lead for one reason or another. Solder is used to join two metals, in a metallic union, at temperatures well below the melting points of the metals being joined. Since soldering is exclusively an intermetallic proposition that takes place between metals only, it is important that the metals be free from all nonmetallic material. Chief among these materials are oxides which form to a greater or a lesser extent on the surfaces of all ordinary metals. Fig. 1 - Tin-lead fusion diagram shows eutectic point with alloy of 63% tin, 37% lead. Oxides form an insulating barrier that prevents metal-to-metal contact. Such oxides or any other inert or nonmetallic material on the surface of the metal to be soldered will foil any soldering attempt. Metal "Solderability." When soldering, the first consideration to take into account is the "solderability" of the metal to be soldered. Solderability is a function of the natural chemical affinity of the metal for solder, the cleanliness of the soldering surface, and any applicable soldering aid, such as hot tinning or electroplating. It should be understood that some metals are not solderable in their natural states. They simply do not have a metallurgical affinity for solder. Some examples are aluminum, silicon, magnesium, chromium, and tantalum. To solder such metals it is necessary first to plate their surfaces with metals that will readily take to solder. Plating metals to obtain solderability, it is interesting to note, is not confined to the unsolderable or difficult-to-solder metals only. It is also widely used on virtually all easily solderable metals to increase their solderability and prolong their shelf lives. Nonmetals, too, such as glass or ceramics, can be made solderable by a process known as "firing." Here, powdered silver is mixed with a borate and heated to a point of incipient fusion with the base substance. The result is a physical entrapment of metallic silver on the surface of the nonmetal. Soldering Problems. One of the most common faults in soldering is the application of insufficient heat. The solution or alloying action in soldering just cannot be achieved without a uniform distribution of heat between the solder and the metal being soldered. If hot solder, for example, is applied to cold metal, or cold solder is applied to a hot metal, there can be no soldering action. Proper soldering can take place only when the metal being soldered is hot enough to maintain the solder in a liquid state. Anything less results in a "cold" soldered joint. It is important to recognize that soldering depends on the amount of heat absorbed by the metal being soldered. A common source of frustration is the attempt to solder a heavy piece of metal with a low-wattage soldering iron that has insufficient capacity to deliver the required amount of heat. For most jobs, the ordinary soldering iron or pencil is most widely used and very effective. But care should be taken to select an iron with a wattage capacity that is adequate for the job. The tip, usually a solid bulk of pure copper, should first be cleaned and tinned with solder before any attempt is made to use it in actual soldering. (Wear on soldering tips is not due to erosion or to the soldering flux. It results from the molten solder. Wear is often dealt with by plating the copper tip with iron, but such tips are less effective in transferring heat to the metal to be soldered.) Most important is that the applied heat be adequate to bring the metal being soldered to the alloying temperature. Fig. 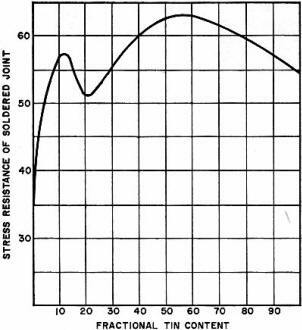 2 - Graph shows change in joining quality of tin-lead solders with increase in tin content, based on resistance of soldered joint to stress. Flux-core solder combines solder and flux, substances whose properties are physically and chemically very different. Taking into account this dissimilarity, flux-core solder is applied according to a technique that provides for the simultaneous liberation of both substances at a single point where the action of both is required. This application technique can be stated as follows: "Apply the flat surface of the adequately heated soldering iron directly against the assembly and simultaneously apply the cored solder strand at the exact point of iron contact." Soldering Flux. Soldering is a solvent action that takes place between metals. This action does not take place if the metals are insulated from each other by any type of nonmetallic barrier. It is the function of the soldering flux to remove any such oxide film or barrier and to keep it away during the soldering operation so that the respective metals can make metallic contact and alloy with each other. A soldering flux, then, is something that causes the liquid solder to make contact with the metal being soldered, or, in technical jargon, to "wet" the metal. Let it be understood, however, that the flux does not enter into chemical reaction with the metal and constitutes no part of the resultant alloy. After soldering, the flux residue and captured oxides, lie harmlessly and inertly on the surface of the solder. There are three basic types of soldering fluxes: chloride, or acid; organic; and resin or rosin. Of the three, only the last is appropriate for use in electronic circuits and assemblies. The others are too corrosive, leading to difficulties shortly after soldering. The rosin fluxes, although much less active than either the acid or organic types, possess two features that completely differentiate them from all other types: they are non-corrosive and non-conductive. These two characteristics make the rosin fluxes very adaptable to electrical and electronic assembly. Most active in the rosin group are the activated rosins, or resins. They are the same as the pure rosins except that they contain small amounts of a dissolved catalyzing substance that causes the rosin to be more active. Although considerably more active than straight rosin, the non-corrosive and non-conductive properties are comparable with those of pure rosin. In more than 20 years of worldwide use, there has never been an authentic instance of corrosion attributable to the rosin flux residue. The Solder Alloy. Solder secures attachment by virtue of a solvent or metallurgical action. But this alloy action will not take place unless the solder is of adequate quality with respect to composition and purity. When tin is added to lead, the melting point of the lead decreases along a composition-temperature line. Similarly, when lead is added to tin, the melting point of tin is lowered along another composition-temperature line. The intersection of these two lines is the eutectic point (see Fig. 1). The composition is the eutectic alloy made up of 63 percent tin to 37 percent lead, and the temperature is the eutectic temperature of 361°F. It will be observed that solder compositions other than the eutectic alloy do not have a sharp "melting point." 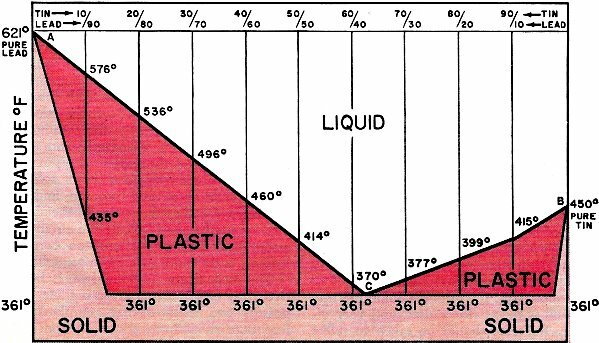 Rather, they have a plastic range extending from the eutectic temperature of 361°F to the melting point of pure lead or of pure tin (621°F or 450°F, respectively). The eutectic has a laminated microstructure characteristic of a single constituent. Other solders have a multicomponent microstructure showing high tin or high lead crystals imbedded in the eutectic. Since tin possesses a higher metal solvent action than does lead, the alloy quality of solder is very closely related to its tin content. As can be seen in Fig. 2, solders containing 30 percent tin are markedly inferior in joining quality. There is an extremely abrupt decrease in alloy quality beginning at about 20 percent tin; solders in this alloy range are sluggish, immobile, and difficult to use. Complicating the quality of these low-tin solders is a tendency to incorporate soldering fluxes that are inadequate from the standpoints of flux content and flux stability. When attempting to use a low-tin solder, it is particularly important to employ an adequate volume of good flux. The alloy quality curve reaches its maximum at about 63 percent tin, corresponding to the composition of the eutectic alloy. These eutectic solders are the most mobile and free-flowing of all solder alloys. They are also used almost exclusively for such exacting requirements as printed circuit soldering. It has been noted that the quality of solder is related to its purity as well as its composition. However, much confusion exists about solder impurities. This is due in part to a lack of definition. For instance, in tin-antimony solder, silver would he an impurity, whereas in tin-silver solder, antimony would be an impurity. In estimating the quality of solder on the basis of a chemical analysis, it is important to consider not the total amount of the impurity, but the relative significance of each element instead. Finally, it should be understood that having solder analyzed does not have any effect in solving a solder problem. If solder is causing a difficulty for any reason, the best way to solve the problem is replace the solder!